Nearly everything you need to know about engaging the whole organization in change and learning processes with the help of digital facilitation. Digital facilitation is a modern approach to organizational development that combines traditional live workshops with real-time virtual communication and asynchronous virtual collaboration. As a facilitator, it allows you to bring a large group of people together to collaborate on complex learning programs and organizational development processes. Digital facilitation allows participants to engage with one another not only during a workshop but also before and after. This way, each participant becomes an active change agent, instead of a passive bystander. In this ultimate guide, we'll walk you through everything you need to know about digital facilitation, including the benefits, best practices, and the best tools. As we move further away from the top-down management of yesteryear, the need for internal communication and company-wide participation is only going to increase. Thanks to modern technology, we no longer have a reason to limit the number of participants we invite to our organizational development initiatives. This means that you can — and should — engage a much bigger audience at once. Traditional facilitation is inherently workshop-centric. While there’s nothing wrong with a good workshop, it’s important to acknowledge that only 10% of learning and development happens in such a controlled setting. That's why you'll want to make sure that all the participants have an equal chance to contribute and learn. The best way to do that is by supplementing your workshops and meetings with pre- and post-workshop assignments and discussions. In the traditional model, a large majority of a consultant’s or facilitator’s time is spent on documentation. After all, face-to-face workshops are often heavy on sticky notes, and turning those scribbles into coherent notes can take longer than you would expect. Digital facilitation allows you to share the responsibility of documentation, and to stop spending your precious time on busywork. Online meetings and workshops are great examples of virtual facilitation. In short, the approach brings remote team members together to discuss relevant topics in real time. Email communication is asynchronous in nature. Although the respondents can reply immediately, they don’t have to. The same exact logic applies to asynchronous facilitation. Face-to-face meetings and workshops can also be facilitated digitally. Instead of asking participants to write on sticky notes, you’ll simply collect their ideas to a digital workspace. With digital facilitation, learning and ideation doesn't have to stop when a workshop ends. Quite the opposite. It allows the participants to co-create and share their experiences not only during but also before, after, and in between workshops. Digital facilitation allows you to involve large numbers of people together to collaborate on projects, change initiatives, and learning programs. This way, transparent collaboration can be brought into the largest organizations and communities. In a traditional classroom workshop, there are always just a few people asking questions and sharing their expertise. Digital facilitation makes it easy for everyone – even the shyest ones – to take part in the discussions and voice their opinions. People are different. Some work better at night, others in the morning. Digital facilitation gives people the opportunity to join the development process whenever and wherever they want. Sharing ideas, comments, thoughts, and conclusions has never been as easy as it is right now. Digital facilitation makes coordinating these conversations and ideas easier than ever before. Using a digital platform to host all the exercises and discussions saves time and makes it easier to focus on the process instead of the documentation and note-taking. Whether you’re leading a one-day workshop or a 6-month project, you'll want to make sure that the whole team is working towards a common goal. And remember, having a goal means nothing unless it's created together with the team. One of the best ways to engage people in the beginning of a project is to ask them about their expectations. Knowing what the participants want to achieve will help you plan future interactions and manage expectations. Speaking of planning, successful digital facilitation relies on thorough process design. Remember that each and every interaction has its unique purpose, and that it’s your job to find the right facilitation method to match that purpose. Although planning is important, sometimes it’s even more important to know when to improvise. By constantly collecting feedback from the participants, you’ll be able to adjust to their pace and find better ways to facilitate the process. The good news is that facilitators have a plethora of modern tools to choose from. The bad news of course is that until now, each of these tools have only managed to solve one part of the puzzle. Don’t believe us? Take a look below. Free survey tools like SurveyMonkey, Typeform, and Google Forms and great for creating short questionnaires. SharePoint, OneDrive, Google Drive, and Dropbox allow you to share documents and materials with the participants. If it’s virtual meeting you’re after, tools like Skype, Hangouts, or Zoom can go a long way. PowerPoint and Google Slides are great ways to report your findings and share information with the participants. Messaging tools like Yammer, Slack, and Flowdock are great for activating participants between workshops. Project management tools like Trello, Basecamp, and JIRA help you document your progress and manage the schedule. As the myriad of examples above illustrates, many popular online tools have their uses when it comes to digital facilitation. However, digital facilitation platform Howspace is the only one specifically designed for the job, which means that you won’t have to spam your participants with individual links to a dozen different tools. Instead, it allows you to host all the discussions, information, and materials neatly in one place. Ready to bring everything and everyone on the same page? Start your free trial today! No strings attached, no credit card needed. Looking to get started with digital facilitation, but don't really know where to start? What's the difference between digital, virtual, and face-to-face facilitation? Digital facilitation democratizes organizational change and learning initiatives, since the rule of the loudest no longer applies. Download the guide to find out how 5 organizational development professionals use digital facilitation to accelerate learning and organizational change. 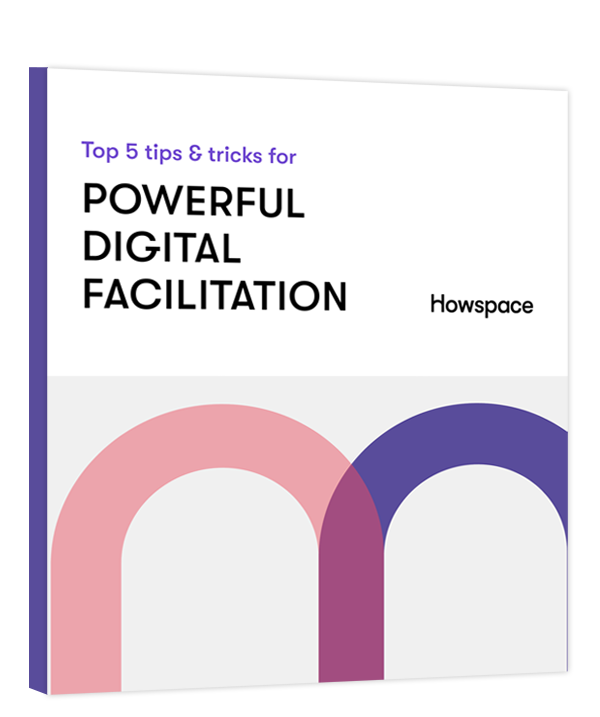 Complete the form to download our digital facilitation eBook!